Happy Weekend Everyone! This is the first weekend in what feels like forever, that I'm not doing anything! It feels weird and wonderful at the same time. On the weekend I tend to opt for a much lighter look, that doesn't take much time yet looks gorgeous. It is also the perfect time to try out products from my 'stash' getting a real use out of things I haven't used in a while! Starting with the base, the go to at the weekend recently is the Bare Minerals Complexion Rescue, I've had this tube for a good two years now and its still going. Should probably throw it out but I can't part with it, the coverage is just enough to look awake, the glow is gorgeous and it is so hydrating. I've also been using this L'Oreal Glam Bronzer, I don't seem to have ever, EVER used this bronzer and why I haven't is beyond me. It's such a gorgeous warm tones bronzer that adds a sunkissed colour to my skin, its very finely milled too so blends like a dream. I think I bought this just because L'Oreal had a 3 for 2 offer and I needed something else to buy - those kind of offers are my weakness. To add a bit of colour back into my tired face, the NYX Illuminator is my go to. Another product that seems to be hidden away and not get enough love, the radiant shimmer that this product contains makes your skin look vibrant and refreshed - perfect for the spring! Wearing eye makeup more often is something I am loving at the moment, it really doesn't take long to quickly sweep a few colours over the eyes.Makes me look 100 time more awake than I did before too. The Collection Palettes used to be my addiction a few years back and the Rose one is a great staple everyday palette. The fallout from these shadows is ridiculous and the pigmentation isn't the best but they look stunning on the skin and lasts all day. My mascara got to at the moment is the Eyeko Lash Alert*, where do I start with this one?! It's a revolutionary formula, that not only gives you length and volume but also treats your lashes at the same time. It contains caffeine and fibres that lifts the lashes, along with Shea Butter, Arginine and Biotinoyl Tripeptide that strengthen the damaged lashes. Inspired by Korean Beauty, the fuss free packaging and vibrant blue tube has my lashes looking and feeling amazing! Just look at that volume!! 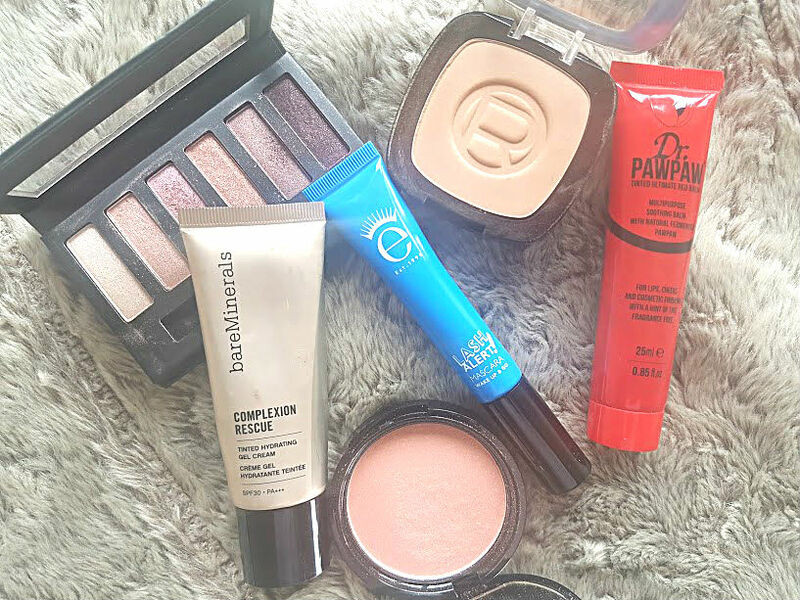 To finish this very easy breezy makeup look, I've been opting for the DR PAW PAW Red Balm that Nishi gifted me at Christmas, why it has taken me so long to try these is beyond me! They add a subtle colour to the lips and keep them hydrated all day. I'm all about simplicity and easy going at the weekend what about you? !